In the move toward improved patient care, healthcare organizations manage an infinite amount of sensitive data including electronic health records (EHRs), protected health information (PHI), and personally identifiable information (PII) such as patient records, insurance coverage and payment details. Managing access to all of this sensitive data is a tremendous challenge. Hospitals’ reputations have taken major blows when news of this information getting to the wrong hands makes headlines. In addition, HIPAA and HITECH are becoming increasingly aggressive at finding healthcare organizations that do not effectively secure this information. In an era of getting the information to the caregivers quickly, how can healthcare organizations ensure that only the right people have the right access to the right resources at the appropriate time, organizations struggle to comply with these regulations? 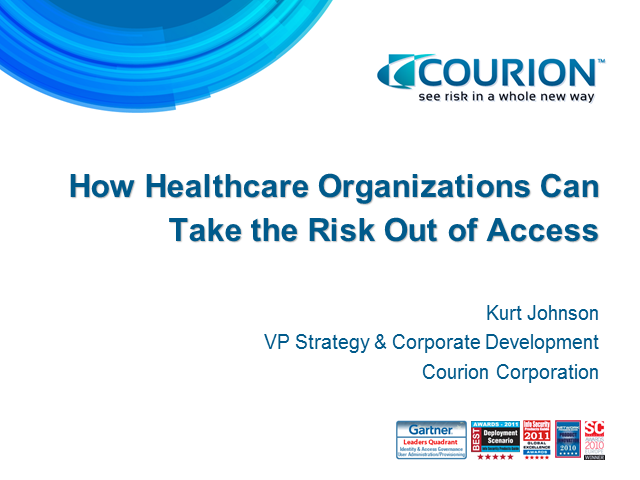 Join Kurt Johnson, VP of strategy at Courion Corporation, pioneers of a risk-driven approach to identity and access management, as he discusses how healthcare organizations can take the risk out of managing user access. Courion Corporation delivers software solutions that effectively and securely manage access risk. Fourteen million users across more than 500 organizations rely on Courion's access risk management technology to align user access privileges with corporate and regulatory governance policies. Courion's cloud and on-premise solutions provide a full range of identity and access management functionality while demonstrating compliance and achieving quick time-to-value. For more information, please visit our website at www.courion.com, our blog at blog.courion.com, or on Twitter at twitter.com/Courion.